The InMobi Network Versus The Google / Admob Network, How Do We Stack Up? Last Friday, the friendly folks over at Admob released some very interesting databout their network size, growth and composition across the world. 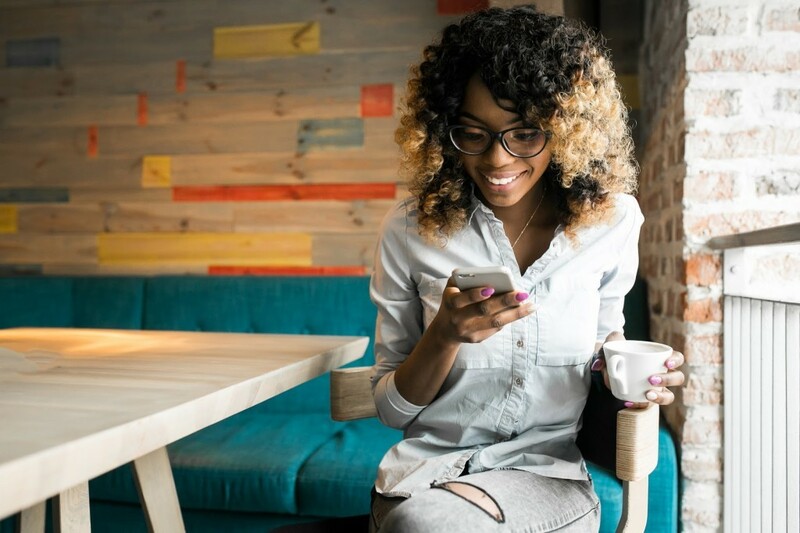 We took this datand dissected it in order to conduct comparison of the InMobi network versus the Google / Admob network, to see how we stack up. 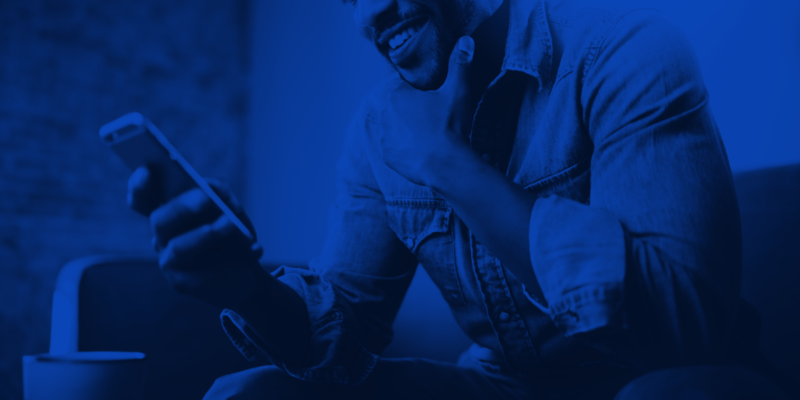 The results are very interesting and help substantiate the remarkable growth InMobi has experienced in just four years, with only $15 million in funding. With over 1 billion ad requests daily the InMobi network now represents half the size of Google / Admob. Over the past 12 months, our network has grown by over four and half times, slightly outpacing Admob's network which has quadrupled. Interesting findings come to light when we dive into the network composition globally. The two networks differ most significantly between the two largest regions, North Americand Asia. Given the history of each company (InMobi was founded in Indiand Admob in the U.S), it's not surprising that Asirepresents 54% of the InMobi network and North Americ18% (versus 33% and 43%, respectively, for Admob). InMobi North Americoperations launched only seven months ago, in June 2010 and InMobi is already one-fifth the size of Admob in this region. Beyond North America, we see that InMobi has substantially greater presence in Africa, where 11% of all InMobi ad requests originate. 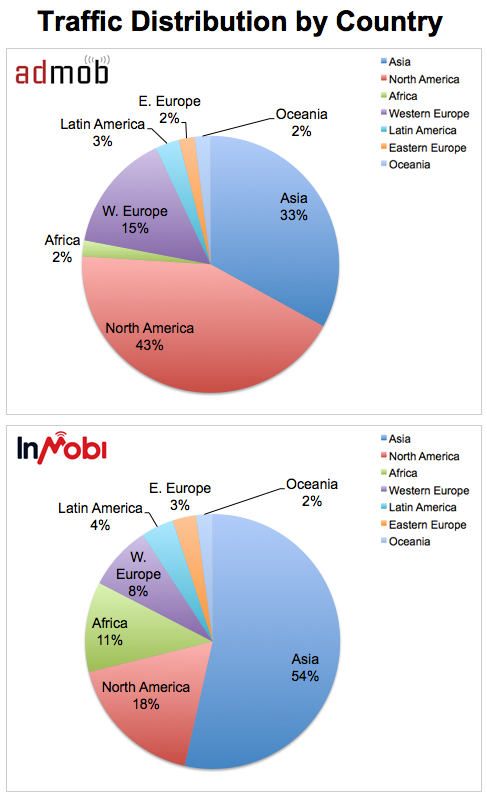 Western Europe represents only 8% of the InMobi network, compared to 15% of Admob. Latin America, Eastern Europe and Oceanirepresent relatively similar portions on our network when compared to Admob. 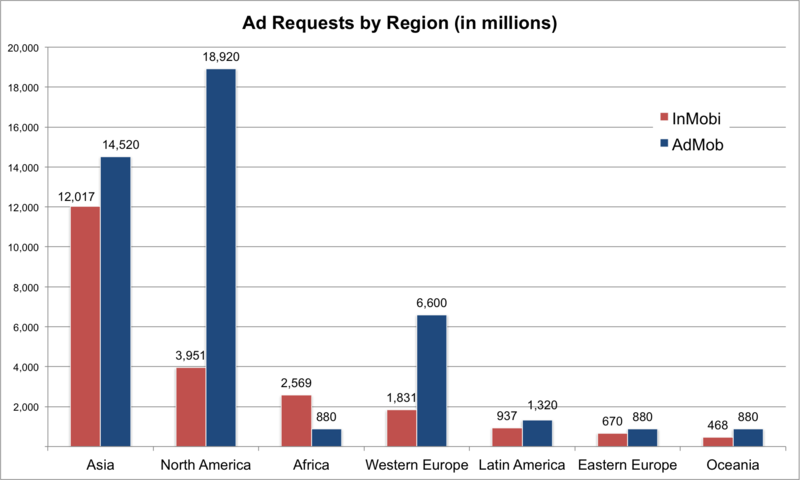 When looking at the total ad requests by region, we see that InMobi is the leading network in Africa. In other emerging mobile markets, Latin Americand Eastern Europe the share is very similar across both networks. Admob still leads InMobi in North Americand Western Europe. 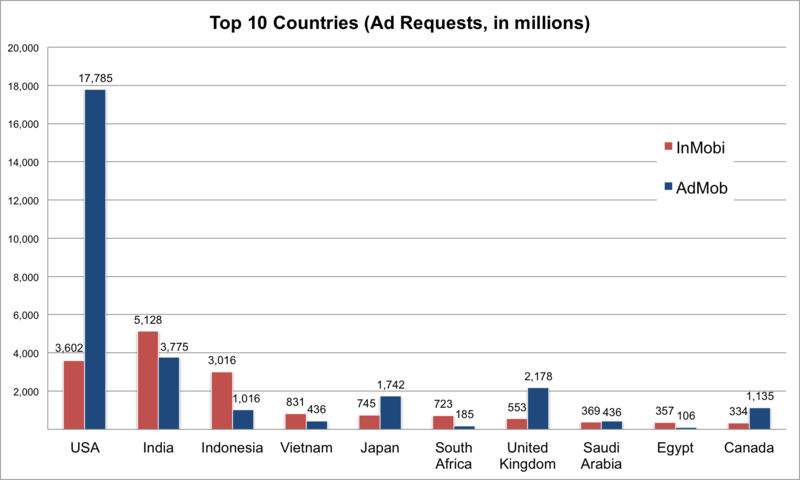 Lastly, we focused on analyzing the top ten countries by InMobi ad requests across the world. In five of the top ten countries, the InMobi network is larger than Google Admob (India, Indonesia, Vietnam, South Africa, and Egypt). While InMobi may still lag behind Admob in some markets, we have been able to sustain similar position to Admob in many emerging markets and penetrate deep into advanced markets. Markets where Admob has held leadership for sometime. The Admob network may still be twice the size of InMobi, but we're gaining fast. It will be interesting to see how this all plays out in 2011. As always, tweets, comments and readership are welcome. We look forward to hearing your feedback.